Well the much awaited HTC Jetstream has already out for shipping in the Market. As it was announced earlier this model is out with AT&T now. Now all the specifications are released on AT&T’s website. With this model AT&T has for the first time introduced their 4G LTE services. The Jetstream is powered by Honeycomb aka Android 3.1 based operating system which gives access to thousands of applications from the Android market. It has a Snapdragon a 1.5 GHz dual core processor which easily supports multitasking. 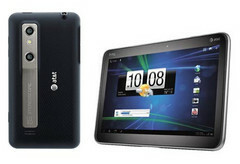 The 10.1inches screen provides a 1280 x 800pixels WXGA display panel. The screen provides 16 million colors which is also a High-Definition multi-touch screen. It is built with a 1GB RAM and the storage provided is 32GB. It also supports an external microSD storage medium up to 32GB. HTC has provided a powerful 8 megapixels camera with a dual LED flash with this model at its rear. Even the front camera assisting on video calls is about 1.3megapixels. This model has dimensions measuring 7 x 9.87 x 0.51inches and weights around 25 Ounces. For connectivity it has Bluetooth 3.0, LTE and Wi-Fi. Along with the latest 4G LTE services it can also get connected to internet via AT&T’s Data Connect 3G networks wherever 4G network is not available. AT&T will also be providing International connectivity. It can also be upgraded with FOTA capability. Other wireless technologies included with this device are GSM, GPRS and EDGE. Ports for Jetstream include HDMI and USB. There is also a list of accessories included with the pack as informed by the website. These include the basic accessories like the USB cable, a Quick Start guide, Safety and regulatory guide, a Charger and pre-installed AT&T SIM card. For a consumer there are actually two options provided by AT&T for purchasing the device. One is with no commitment where the device is priced at $849.99 while the other with a contract of two years and priced $699.99. The contract actually proposes a commitment of a minimum data plan of $35/month for two years. While no commitment service requires a data plan of $14.99 pre-month as a minimum. Well now it’s all up to you for which service you want to opt for. But as a whole this device can be termed as the HTC’s answer to all other Tablet giants. The price can make some of the customers give a second thought before buying this particular tablet but the 4G LTE tag may also help him decide.